Last Sunday at the farmers markets I spied the most divine looking bunch of beetroots. They where the freshest, healthiest, most gorgeous looking beetroots I had ever seen. I think if you googled for images of the best specimen of beetroots in the universe, these would have shown up. Really, they where beetrooting for Australia. I had to have them. I came home and roasted them, cut them up, and the tossed them with a light dressing of olive oil, lemon juice, sea salt, and fresh water cress. Then I put them lovingly on the table while the beetroot angels sang. It was a special moment. I was beaming, as if I had grown them myself. Today’s lunch was bought to you by..Leftovers! Honestly, you’d think I had of invented it or something. I didn’t even put any illicit substances in it. Would you like to know how I made my family love beetroot without even knowing it? It’s too easy. 1 bowl of roasted, chopped heavenly beetroot. Or use tinned, whatever. 1 tin of drained chickpeas. A large glug of olive oil. A large pinch of sea salt. Taste it and adjust to your liking. Sometimes a lemon won’t be sour enough, so you might need another one. The important thing is to eat some yourself before your beetroot converted family hoover it up. Serve with crackers, carrot sticks, chunks of cucumber, Turkish bread toast..
Have you cooked anything differently to turn your family around? Did you tell them what they where eating? What is your favourite thing to cook, featuring leftovers? 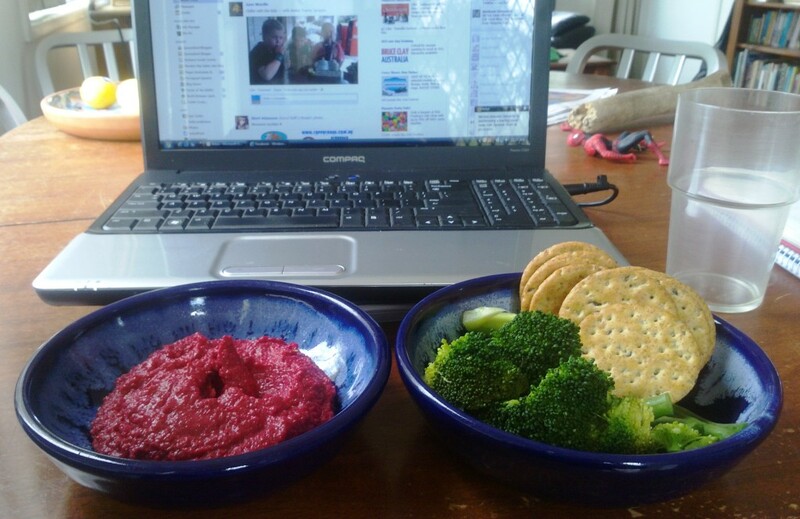 Yummo…hav made very similar and yes the non eating beetroot kids scoffed it down! I LOVE beet root, but haven't had it for so long. This looks like a very delish recipe. Wil try it when I get back to my kitchen. I love beetroot cooked as a vegetable but not so much pickled – this looks like a great way to try it!